With a gold tinsel curtain and giant, silver balloons spelling out ‘FAT’ on the back wall, and accompanied by banging early ’00s party tunes, it’s easy to think this is a celebration of fatness. A lot of the show feels like it is. But Greenall lets us know that as much as she wants to celebrate her size, she’s still not totally accepting of it. Her quiet contemplation of her body is a surprising, effective contrast to the otherwise upbeat mood. Snapshots – both verbal and photographic – from various points in her life are interspersed with poetry, games and audience interaction. All of these moments stem from either how she views herself or how others perceive her. Most are underpinned by humour and presented as jokes or fun activities. Though the show strives for radical self-love, it reminds us that being radical is a daily battle that can be lost more easily than it can be won. The audience is unfailingly on her side throughout – she is a magnetic performer, and no doubt every single one of us has at some point fallen into a spell of self-loathing brought on by unrealistic expectations of how to have a body. Greenall importantly draws attention to thin privilege, but this show is a comforting – and celebratory – acceptance of difference. It’s a must-see for anyone with a body. 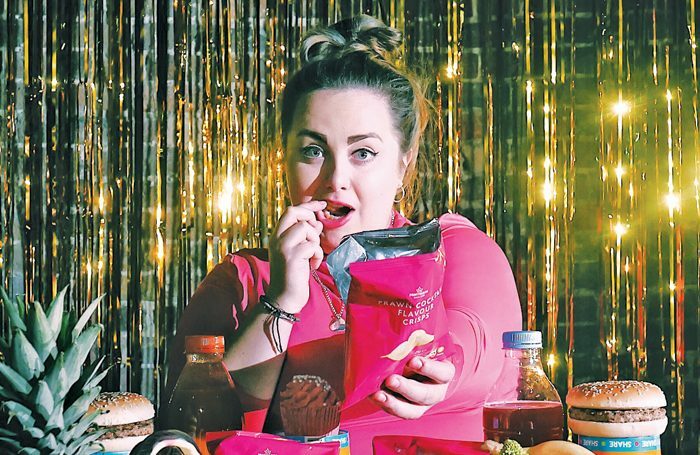 Fatty Fat Fat runs through 3 February.